Leather has always been a mark of style. From leather jackets to pants to boots and more, there’s something about this material that just … rocks. It also plays a significant role in furniture, as the sturdiest material you can find for couches while also adding a high-class touch. For many, like myself, the fact that leather comes at a significant cost to animals tends to lessen the appeal. A lot. Eco-designer and architect Gianpiero Tessitore felt that the moral cost of leather was too high, and sought out an alternative using one of Italy’s biggest unused resources: the left-over grape skins and seeds from winemaking. He studied the vegetal fibers, developing a way to create a fabric with all the appearance and characteristics of leather, just made with the by-product of winemaking. 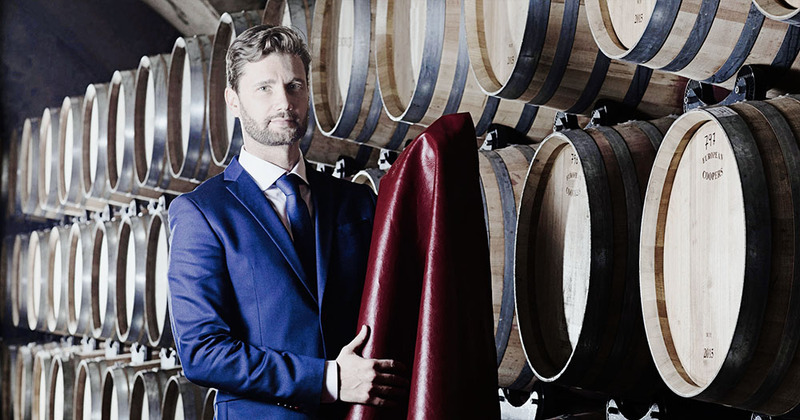 In January 2016, he founded Vegea Leather, the Milan, Italy-based manufacturing company that takes the pomace from local wineries and transforms it into wine leather. Wine leather is a new take on Italy’s too major exports – leather and wine. It comes in at a time when many people are trying to find eco-friendly and sustainable products for their personal use; and businesses are increasingly sourcing eco-friendly and sustainable materials to use in the construction of their products. Since Vegea Leather’s material can be used in all the same ways as animal and synthetic leather – apparel, accessories, furniture, car interiors and more – there is an expectation that it will eventually replace its crueler, less animal-friendly counterpart. Mass production is only one of the priorities at Vegea Leather. They also put quality, adaptability and environmentally safe practices high on their list. As I’ve already mentioned, wine leather is animal free; it is also pollution free with no tanning waste (heavy metals and acids are used to create skin-based leather), and uses little to no water (compared to the 240 litres of water needed per meter of skin-based leather). This concern for the environment combined with the fact that wine leather could actually replace skin-based leather, won Vegea Leather the Global Change Award 2017, awarded by the H&M Foundation. This award recognizes the biggest challenge for innovations within the fashion industry and highlights those who are making steps towards a better future. Their first furniture prototypes were featured at Vinitaly in April, 2017 – sofas and armchairs were displayed in the piazza dante, in the center of Verona, and in the VIPs lounge area at Nespresso (inside the fair). As wine leather gains popularity, more and more people are learning the truth about the leather industry – perhaps even considering the sustainability of leather itself – and turning to alternate fabrics to give that rebel-without-a-cause look without having to actually be a rebel without a cause. Other companies across the world are taking advantage of their environment to create leather replacements: Green Banana Paper, from the island of Kosrae in Micronesia, makes “leather” wallets, papers and bags from banana fibers; MycoWorks uses mushrooms, “mycelium and agricultural byproducts” to make leather in San Francisco; and through London, UK-based Ananas Anam, pineapple leaves become a non-woven textile called Piñatex. There are cruelty-free options out there. We just have to look for them. And perhaps, in a couple of years, animal skin leather will be a thing of the past.